The Cayman Islands (esp. 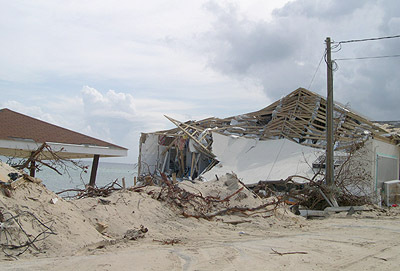 Grand Cayman) was hit very hard in 2004 by Hurricane Ivan. At the time I'm writing this (June, 2005) most of the island is pretty much back to normal, or even better than before!. A very detailed report on the storm is authored by Simon Young, sponsored by UK's DFID. It addresses the storm's hazards -- rain, wind, storm surge & wave action. 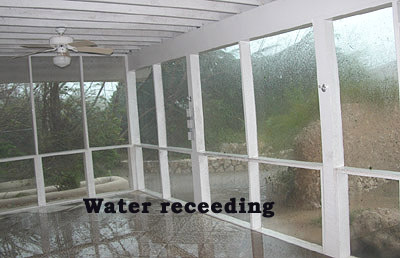 view report (taken from www.gov.ky (Cayman Government Website). Other good information from the Cayman Government can be found here. Cayman will be lifted effective 20th November 2004. Department of Tourism that they are now open for business. confirmed that more than 75 restaurants are currently open for business. the pace of the recovery and support the Cabinet's two main initial priorities. for all residents. The Chamber of Commerce is not profiting in any way by makin! available for rental accommodations in Grand Cayman in November. financial services sector (88%), merchants (80%) and construction sector (94%). and will be available on the Chamber's website and distributed to the public. and the Chamber staff continues to assist with the placement of workers. lists are available on the Chamber of Commerce website at www.caymanchamber.ky. assist members and the public. various industry sectors and to communicate immediate and long term priorities. complete recovery from the devastating effects of Hurricane Ivan. In an effort to expeditiously answer all of your questions and dispel the many false rumors circulating among the international community, I have posted current restoration progress and projected openings directly to our web site. I will also post this to the popular Caribbean travel forums and make an effort to keep them updated as well. While damage from IVAN was devastating to Grand Cayman, the recovery effort so far has been nothing less than miraculous. With assistance from the international community, both the private and public sectors have been working together feverously to implement restorations as quickly as possible. Only 30 days after a direct hit from the 3rd largest storm in Atlantic recorded history there has already been widespread restoration of power, water, communication and all essential services. The financial/insurance sector is largely restored and operational while most grocery stores, gas stations and building supply outlets are reasonably functional. At least 34% of hotels, and 55% of condominiums are expected to be open within the next two months. 55% of the dive community is reported to be operational as soon as power is restored to their facilities. Over 60% of restaurants are either open or ready to open in a matter of weeks. Over 50% of attractions in general are already open and expected to be fully operational by the end of the month. I have compiled an itemized list of target opening dates after speaking directly with the business owner or manager. In some cases where they are not already open, there are certain contingencies such as getting back power and being able to obtain the necessary supplies to meet their objectives. Based on what I have seen so far, if things continue as they have the dates posted are realistic and attainable. I have included some pictures which demonstrate some of the remarkable progress already achieved. All of the popular dive sites on the North, West and East walls are confirmed to be in excellent condition, as well as Stingray City and Sandbar. Significant movement of sand along the ocean floor has been reported, making many of the popular dive sites different and in most cases even more spectacular and dramatic than before. Some reef damage has been reported along the South side of the island, however this is an area that is not often frequented by divers. Subject to the continuation of the spectacular job being done by CUC (our power company); water companies; and communication providers (and those assisting them), Grand Cayman should be ready to receive cruise ship passengers by the last week of October and overnight guests by as early as Thanksgiving. I DO NOT have absolute confirmation as to these target dates, but will continue to keep you updated as progress continues. Since most of George Town and many activities are restored and operational, I am reasonably certain that the October cruise ship goal is attainable. However, there are still some considerations with respect to the Thanksgiving overnight arrivals. Not the least of which is the Cayman Islands' dedication to maintaining their status as the most upscale, safe and enjoyable destination in the Caribbean. The Tourism Department will not allow arrivals until they are 100% certain that each and every visitor will be assured of the very best of the services which they expect to receive - in clean, safe and beautiful surroundings. Much work remains to be done before this is possible, but given the drive and commitment of the Caymanian people it is certainly not unrealistic. The level of improvement which occurs during the next few weeks will be a crucial deciding factor, and I will continue to post new information as it becomes available so please check the links provided as often as possible. Once bookings commence, I encourage you to confirm all reservations directly by phone or email and to book as many activities in advance as possible. For at least the next several months there will be fewer rooms, rental cars, dive/snorkel boats, tour operators, etc., so it would be a good idea to book these activities ahead of time. If you do not have a current Activity Guide Magazine, the operators' contact information and links to their respective web sites can be found on our web site at: www.caymanactivityguide.com. As the target opening date becomes more concretized, I will print an appropriate amount of magazines for the remainder of November and your copies will be delivered as well. For anyone already booked with accommodations for Thanksgiving onward, I STRONGLY encourage keeping those reservations (assuming the facility is scheduled to be open). Not only will it be busy season, but there will be fewer rooms available and it is inevitable that demand will quickly exceed availability. However, as travel professionals I am sure that you know that the best way to help the Cayman Islands get back on their feet is to send as many visitors as possible, as quickly as possible. It is for this reason that I am providing you with the most current and accurate information available, in an effort to assist you in this endeavor. Thank you in advance for your assistance, patience and understanding during these most unfortunate and enduring of times. the weather stripping in all of our doors so they were fairly water-tight. be high and dry. WRONG! consisted of raw sewage mixed with sea water - really nasty stuff! house to no more than 3 - 4". before slowly returning to its normal level. walk around the house to see the damage. the storm advising people to stay indoors - duh! took a walk around the neighborhood. were reported and all of our friends and neighbors were accounted for. us with much needed showers - this gave our neighbors quite a little treat! quickly most of our trees and plants have started to grow new leaves. information had been disseminated to the outside world. filtered out of the pool. anything nature throws at us! under Marshal Law with a 10:00pm curfew, raised from 6pm a few days ago. so most of the trees are bent over at a 90o angle facing south west. will likely take another several weeks. There are no longer any lines at gas stations, supermarkets, stores, etc. materials which are in short supply. overnight visitors later that month or the beginning of December. start on our house once the appraisers give us the go ahead to start work. brand new house. All those insurance premiums are actually going to pay off! since neither one of us is currently employed! also something that neither of us have any desire to experience again! AS A CENTRAL CONTACT POINT. PLEASE ENTER YOUR CONTACT INFORMATION INTO THIS DATABASE. CONTACT INFORMATION SO THAT WE ARE ABLE TO HAVE OWNERS CONTACT YOU. Just to clarify a recent update, as I know many people who left the island and overseas friends are still checking this site for info, the downtown area of George Town has power but many areas of the rest of George Town still do not. We do expect this will change within the next week or so. I live in George Town and I am one of the lucky ones who has a generator that we run a couple of hours each evening. Unfortunately in the area I live there are many homes that had 4ft or more of water so when power is restored they will still not be able to enjoy electricity until their places have the proper wiring done etc. The only thing we really miss is the a/c and the units may not work anyway as many were under seawater etc. On the other hand, we are not under the running water restrictions so we find great pleasure in cold showers! The biggest problem most people have is housing. No one I know of is in the same position as they were before the storm. Either their place is destroyed, or their place is livable but have taken in homeless friends, like me. It will be many months before our housing situation is back to normal. We are cautiously optimistic that by the end of December many people will be back in their homes with working appliances etc. Right now the challenge has been buying cars as the estimate is that 8,000 were destroyed. Then comes housing materials, furnishings etc. It is quite a daunting task to rebuild so much in such a short time. Many people are working tirelessly trying to make it happen. We are all aware that there is still 2 months left of the 2004 hurricane season so we are trying to get roofs redone etc. just in case! PS So as not to confuse our Caribbean friends, George Town, Cayman Islands is two words, unlike Georgetown, Guyana. Just wanted to update you on http://www.hurricaneivan.ky since you have been such a HUGE help in getting the word out. Today at 4pm will mark one week since I launched the project and we have officially hit the $2000 mark! Thanks for the support. Water has been partially restored to most parts of the island. In some areas water is only on for a few hours in the morning and a few in the evening so that the water company can carefully check lines and ensure that no systems were damaged. We ‘borrowed’ electrical linesman from Canada and South America and they have been moving at an astronomical rate to restore power island wide. So far Georgetown is fully restored and parts are restored in West Bay, Seven Mile Beach, and some of the Industrial Park area. They are hoping to have power restored to the Crewe Road area after this weekend. The Crewe Road area is essential because it is a link onward to South Sound and eventually getting out to the East End district. We are excited to wake every morning and see the progress of the day that has past. It is being said that we will start welcoming our beloved tourists as early as the beginning week of November! We can’t wait! place looks like in a just a couple more months! after launch! Thanks for everyone's support! I have just got back from a week in GCM (Recovery Work for Fosters) and will return on Mon for another week or 10 days - I am among the very very fortunate - I live on Cayman Brac and can skip over for an R&R period, as many from Grand Cayman are doing. Yes - there is damage ranging from catastrophic to moderate depending upon what part of the Island you go to - I drove around on Friday - actually got lost on my way to Rum Point to do a specific job - go figure - for me the usual land marks are gone. Luckily had about 30 bottles of frozen water in the car and 2 cartons of cigarettes so was able to stop and talk and offer some little respite to some of the many people (all people working to recover Cayman - all colours and all nationalities) working especially out at East End - above all else was such a display of resilience and determination that I then resolved to take no more pictures of damage - only of work and smiles - yes there are many of those around thankfully. I cannot talk of any other organisation with any authority at all - but I can say within the Foster Group of Companies the morale and total dedication to a full recovery to better than before makes me immensely proud and privileged to be alongside these men and women - regardless of their normal status within the Companies, everyone is pitching in on the manual as well as the mental work. Yes, there are setbacks, major problems and more difficult times ahead but the spirit displayed by ordinary people is something that cannot ever be quelled. As the curfew is gradually lifted (think it is still 10PM to 5 AM) some Bars and restaurants are opening up even in a "basic" format - people are able to get out and try to relax a little. I saw no examples of drunk, irresponsible behavior - I am sure there probably is some - but then there always will be from some people - all I saw was outstanding comradely. Whilst I did come back somewhat tired, bruised and aching and not necessarily smelling my best, I also came back with an immensely positive feeling of "can-do" - a feeling that echoes back to my military days - belonging, kinship, pride and a "nothing can defeat us ever" cockiness. Progress is going to be an ever growing series of baby steps and stumbles and falls here and there - but guess what - all the bay steps will start to weave together into little strides and bigger strides and then we are going to be up and walking and then running once again. To All - continue the gruelling hard work and keep the spirits up - my mind is with you right now and my body will be back on Monday. your entire life...... we will be so happy to see you all. update expected by Wednesday next week. Well it only took 1 day to exceed my 50GB bandwith limit from the hundreds of people downloading the video so I will have to unfortunately remove it until my limit resets at the end of the month. If theres anybody out there that would like to host it instead and has unlimited bandwith please let me know. Thanks all for the continued support and emails. of albums that I have posted with a timeline from during, after, and now. Might be useful for folks to have a look. the window bulging in and out during the vid. Ive got a live ADSL line at the office thanks to Cable & Wireless! We have set a website to help in the relief efforts. It’s a t-shirt sales site that will be giving proceeds to the islands’ recovery efforts and the non-profits that are taking a huge hit from the disaster. It also has a pretty healthy picture gallery that has photos added DAILY. Soon will be adding over 300 more photos. Let’s keep the word out that this is not over and the devastation is something that we live with here on a daily basis. Everyday we make huge improvements to rebuild our paradise. Thanks for the efforts and everyone’s blessings throught this period! life..... and we look forward to welcoming visitors back with open arms ! friendly, upbeat people all helping each other out. marvel at the strength and positive attitude of our people ! Another one of my special hurricane correspondents surfaced! away and are well in commune living here! are singing "all the leaves are gone, and the sky is grey!" As many of you know, Tortuga Imports Inc. began relief efforts for the people of the Cayman Islands. Since Hurricane Ivan hit the country over the weekend of Sept. 11th & 12th 2004, many of the people of the Cayman Islands are now homeless and in need of food, water, & basic necessities. The response from this relief effort has been overwhelming. I want to thank you all for your donations and continued support. Leslie will incorporate your schedule with ours because we really need your help here. Thank you again for your continued support & God Bless you! Courtney is a professional photographer who has lived full time in Grand Cayman for the past 20 years. In addition to his on-going role as assignment photographer for National Geographic magazine, he is a working part of the Grand Cayman community as the owner of Island Images, which covers all types of commercial photography from advertising to weddings. 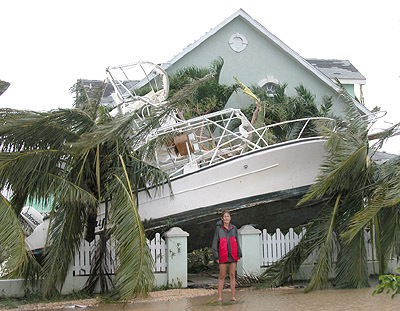 Courtney is currently working non-stop to document the Hurricane Ivan disaster. Princess Cruises Unloading $50,000 Relief Supplies Today! delivering 150 tons of supplies today & being unloaded now onto ships' tenders! Ship anchored off Georgetown today (Tuesday)!! click on Caribbean Princess & voila you will see Georgetown!! 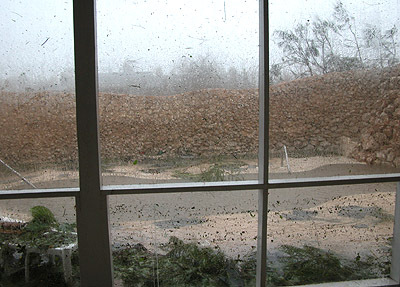 Hurricane Ivan on Grand Cayman. need to make sure their passengers don't want for a thing during their cruise. About 10:00 tomorrow morning, Caribbean Princess will arrive at Grand Cayman. Remember last time you were at Grand Cayman? You tendered ashore, didn't you? ferrying the supplies ashore in a constant stream. every one of those tenders by hand. You can't drive a forklift onto a tender. ship's tenders shuttling back and forth nonstop for six hours. tugged and pushed by hand by Caribbean Princess' crew members. duplicates and many photos that are not very good. no shortage of essential supplies. The CDC has a very informative webpage with practical post-Hurricane tips. Day 9 - finally found some way of connecting to the internet. Words will fail to convey the absolute terror and destruction a category 5 hurricane sitting over your head for almost 2 days can bring. I now know why they call it catestophic. Its an apt description of the devestation wreaked on Grand Cayman by Ivan the Terrible. I walked home to West Bay on Monday morning from the Grand Pavilion building on 7 mile beach . Buildings, landmarks, powerpoles, sedans, SUVs, pleasure boats, dive boats and shipping containers lay in my way. It was an emotional walk. I was halfway when it struck me that there was no way my home could survive something this powerful. Ivan had moved the biggest dive boat in Cayman out of the water and deposited it in the Hyatt parking lot ontop of 10 cars. It had snapped reinforced concrete utility poles as if they were matchsticks. It had blown 2nd floor appartments completely off the 1st floor. Shipping containers that require 16 wheeler trucks to transport were lying helter skelter accross the roads. And the survivors were out looking as shell shocked as I felt. Reaching the old Holiday Inn, I had to negotiate my way accross huge sand dunes that had made their way from the beach over the road. If I could call it a road - most of it was gone. Well my laptop battry is dying - should get power back at work soon so Ill write more later. I am working on putting up my 200 photos and videos onto a website for you all to see - but that will be a few days still. Thanks to everyone for all the emails - since I have over 300 (damn spam) in my inbox - it might be awhile before I can get a reply to all of you. - News from Savannah & Concorde Building Area by Airport. has seen and state of the area they are in. had been looted but the police were well and truly on top of the situation. was an extremely frightening experience but things will get back to normal. information has come out of Cayman. It is greatly appreciated. To all of you who have sent your prayers, kinds thoughts, and words of encouragement ..... Thank you. I have lived in Grand Cayman for 18 years, it is our home, and I was there for Gilbert. This storm "Ivan" was like nothing we of the islands have ever seen. My family and I have lost our home & belongs..a hard reality to face but God did huddle with us. Whoever opened the gates of hell and snuck this guy Ivan out should be ashamed of themselves! I am thankful we after 2 days of waiting in line did get a flight off the island, understand, things are worst than devastating on our island in paradise. Many people do not have water, food etc. and it is difficut if you lost your vehicle to get to available sources. Things are getting better day by day, we are in the States now and my husband is still on the island trying to salvage anything. Please know that the people of Cayman Airways, ATA, Cable & Wireless and many others are doing everything they can to get people out, to get things back online etc. They should be commended for their valant efforts to help....some of the employess are so tired but are keeping their chins up and giving people hope. Thank you to all of them who help, myself and my four children.....we have a much great appreciation for many luxuries we have as Americans, and ice cube we would have paid any price for, a cold soda, but we made it as did many others. Our island in paradise will be up and running again, for all to enjoy....dont write us off.....we'll be back! - From special hurricane correspondent Donna! landlines only cell phones. I some how have hit with my card in the computer. All seems to be going okay here. Will take a long time to get power to homes. the process of getting back to order. Food and supplies are arriving everyday. going to make this short as battery low. I will recharge and write more later. EVERYONE is fine. I will write more tomorrow. My father, Sam Ebanks, Jr. (North Sound Estates) called my brother today. now, since they were just able to get a new one. He has water - for now. disappearing. However, Dad said he has not seen any looting personally. people in the store at one time. It was a 2 hour wait to enter the store. wanted to share what we know so far. stopping in other places allowing folks to fill up water bottles. Hurleys Grand Harbour). Expect lines. Banks are scheduled to be open tomorrow. Repair Supplies - A number of hardware stores are now open. Cayman on Wednesday Sept. 15th. It was a nice & positive tone to hear! They are still in need of food, water, & especially building supplies. electricity. This is a good sign. Friday & should be distributed between today & tomorrow. of canned food & it was shipped by SEABOARD MARINE on Friday Sept. 17th. the goods are being distributed. helped to organize & pack the food, water, building materials, etc. now have almost 6 more pallets ready to go. opportunity to thank each & everyone who has donated and volunteered. your staff have dedicated to helping the people of the Cayman Islands. everything you have done & continue to do is greatly appreciated. - SMS text messaging= less stress on networks and more reliable. Cellular phone networks are stressed to beyond maximum in the Cayman islands. The most efficient way to send messages is via the SMS cellular system. and can be replied to. enabled the "111" code it will send you a confirm when the handset is turned on. radio reports via the internet. While recovering from Hurricane Ivan I understand it may be quite awhile until power is restored and fuel is available. An alternative may be building a solar oven. Water may also be steralized in this way. The plans for building one can be found at the following web site. http://www.re-energy.ca/t-i_solarheatbuild-2.shtml. My heart goes out to all of you suffering thru this tragedy. tens of thousands of people homeless and thousands of buildings destroyed. this hurricane has destroyed their homes and their livelihoods. infrastructure and resources to cope better and recover more quickly. months and we need the public's support to help us provide this aid." help communities recover from the emergency. inhabitants have been made homeless. people can be carried out this weekend. A Red Cross plane of relief items will arrive in the Cayman Islands today. shelters or whose homes have been partially destroyed. pre-positioned on the island as part of their disaster preparedness plans. Cross, FREEPOST, London, SW1X 7BR. maintained 24/7 operations throughout the storm. with a greater sense of urgency., reported Director of Technology, T.P. Friday, Sept. 17 to assist with recovery efforts., Wong said. restaurants have ample supplies of food and are open for business. if we can be of help,. said company President Kirkconnell-Ewing. people of the Cayman Islands. Highness, The Prince of Wales. sending none at this time. FREIGHT as the email  subject. most accurate and up to date  information. You will have it as soon as we  do. the Casuarina Pines. Repairs are expected to commence promptly. units on the ocean side. CAYMAN REEF RESORT - Part of roof has gone but buildings intact. Several units have lost the windows. Beach has gone. CAYMAN SANDS - Minor damage to units 5 and 6.
to the roof but no further info. Interior conditions are unknown. the units. Landscaping is badly damaged, but overall things appear OK.
CORALSTONE CLUB - Looks mostly intact. DISCOVERY POINT CLUB - Buildings are intact with no major damage. lts of sand in the pool. and there is securty on site. THE PALMS - Appears to be in good shape. broken windows appart from on the side of unit 1. Roof looks good. building is intact. Overall looks good. SILVER SANDS - Structure OK, windows are intact but sand everywhere. them. Water in downstairs units. All trees at front are gone. VILLAS OF THE GALLEON - Heavily damaged. No further info. WHITE SANDS - Minimal damage, mainly cosmetic and slight water damage. cell services on the island. They are Mr Groenewald and Tiba. Abigail from SA Embassy has arrived from Washington in Miami to assist the cayman vitims there especially with passports and lost documents. Anyone needing help should contact her on 091 202 361 2914. (This is a Washington no but it is a roving number and will reach her in Miami. I have just spoken to Mr Naidoo at Foreign affairs and please want to ask everyone to only use Abigail for emergencies such as lost documents, people stranded with no help at Miami. It is no use clogging up her phone line to ask her where to find people as she has to issue documents. If you are desperate to get hold of soemone and suspect that they may be at Miami then please call her. Good luck all of you precious south africans. this situation is much improved. environmental and medical supplies as well as generators. being distributed from canteens in the different hurricane  shelters. resumption of service, which has already occurred in some areas  of George Town. suspect as they have been found to contain unreliable information. on Grand Cayman is rapidly  improving. diplomatic mission in the Cayman Islands. may find themselves in distress around the world. I do not have much time to write. Things are crazy here at the hospital where I work. The island was hit hard...much harder than I'm sure the news has reported as of yet. My family and I pulled though due to the newest shelter on the island, but our home did not fare so well. Flood and sewage reached four and half feet in the house and from the outside we can see from the damage that it was well up to the second floor. First things first... go remove what can be salvaged on our second floor that the looters did not take. We take this opportunity to rebuild paradise.. one step at a time. head about what I saw, but it might help some people. airport there, as well as in Montego Bay, Jamaica, is open for business. but no structural damage," said Victor Lopez, divisional vice president. number of ADSL customers online, dialup customers, and dedicated customers. who need to help to get the country rolling again. are definately exhausted but seem to be coping pretty well. 2) I still have not had any confirmation of deaths. are not careful or are in areas where they cannot get clean. 5) The airport is getting a lot of traffic because of people trying to leave. exhausted, and keep having to take a bit of time here and there to rest. I'm feeling like I am coming down with a cold, but trying to fight it. Government must step in and help their citizens in this time of need. Check payable to: MGCEE Hurricane Relief Fund, Inc.
We have consulted with disaster relief organizations with more than 20 years experience to help guide us with this effort. Establishing proper procedures, accountability, directing this effort for East End people and being able to coordinate our relief effort with the Cayman Islands Government relief effort were areas that we considered. We want to make sure that we are part of an organized, island-wide effort that gets the right kind of help to people; ! we believe we can be of great assistance to our own people and others on East End. We are now working on an efficient distribution plan for taking donations and purchasing necessary equipment, supplies, food/water and other products, and sending them to East End in an efficient manner. Currently, hundreds of island residents are living in the East End shelters. We are starting deliveries to the island as early as Thursday, September 16th. Steve Cummins has already had conversation with Government Officials to let them know that we want to provide assistance to East End and that we want to work in harmony with island-wide efforts. We will have the Government East End Representative and others involved, ensuring we provide the proper assistance. A conversation with Steve on Wednesday, September 15th started the list of needs, which we will continue to update and organize through the Global Resort Management office in Clearwater, Florida. � CPA Gary Sweat (Strawn, Marshall, Cunningham, Condon & Sweat, St.
Petersburg) - reviewing receipt and disbursement procedures. We are very thankful for this assistance. We look forward to an island-wide recovery. We appreciate your consideration of the MGCEE Hurricane Relief Fund, Inc. for contributions. We will provide summaries of the use of donations received. medical personnel, unfortunately, he died on Tuesday night. boat in heavy winds. No further information is available at this stage. over the course of the next day. * Hurley's and Fosters supermarket at the airport are open. such as the hospital and the airport. Cayman Brac and Little Cayman. Please call 1-800-G-CAYMAN for more information and please be patient. will transport back anyone who wants to depart to the UK. plastic purchased from US AID (US Agency for International Development). accommodations. Other supplies are also on board. British officials in Washington to provide support to the Cayman Islands. electrical generator, and 25 large tents among other supplies. Account #621506296065 with JP Morgan Chase Manhattan Bank. 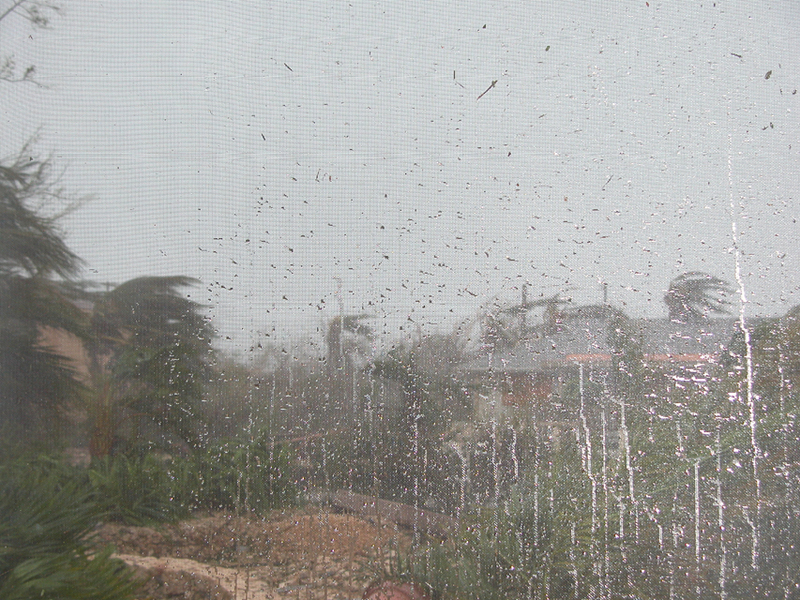 - ALL IS WELL ON CAYMAN BRAC! ALL IS WELL ON CAYMAN BRAC! is back up, as is my Cable and Wireless cellular telephone service. people coming from the havoc of Ivan-torn Grand Cayman. 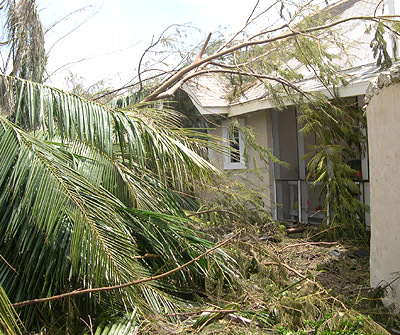 restored, much to the credit of Cable and Wireless Ltd.
from Cayman Brac to Crand Cayman as Ivan bore down suffered damage. 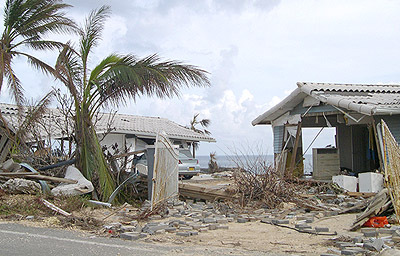 of the island of Cayman Brac were either washed away or damaged. donate to the huge need on Grand Cayman. services for local resorts normalize. for the upcoming tourism high season. one of the supermarkets and get supplies. individual damages & salvage whatever they can. leaks from the roof but nothing to complain about as compared to others. Finally he said no one was killed. Please post where everyone can see this. who has a concern for this wonderful country. our responsibility to paint an accurate picture of what is going on. home, get back on it's feet again. needed information; "don't let your emotions get in the way of the facts"!!! and as such a date cannot be given as of today. Commercial District, Airport, and Industrial Park areas as soon as late today. Street branch as of today. times yesterday and asked specifically about the looting I had heard about. said they have not had any issues with looters and the stores were fine. other grocery stores were opening today from what he has been told. lots to do and it will take time and patience. - Cayman, Pearson family OK. Title: Cayman, Pearson family OK. I eventually got a hold of my brother yesterday and they are all fine, some damage to house and apartment along with the new aquarium including the fish, but all ok. No power and will not be any for some time, poles are down everywhere. They are being rationed to about $50.00 groceries and 5 gallons water each day per family. He mentioned that as far as he knows that there were no fatalities. As there is no power, cell use is limited to what battery power they have, Keep it short. I hope this eases the minds of other people. P & P Services, Inc.
7:30am Cayman time. The report is that "the conditions are relatively calm." prorvided. Hope this helps some. THIS TO GET IT TO G-CAYMAN. I have too clarify: Although there was ALOT of damage on the Island, in general, the people on <?xml:namespace prefix = st1 ns = "urn:schemas-microsoft-com:office:smarttags" />Grand Cayman feel safe. The 6pm-6am curfew was put into place for many reasons, and one of those is to help the police stop criminal activities at night. Plus, not having any light in the streets, it would be pretty silly to stray to far from home after dark. The police are stretched, but are doing a great job under the circumstances. It is true that a military presence would most certainly help, but as of now, we have not seen an international military aid. Most people are using candles and flashlights after dusk. We have driven around the island both at night and day and we have never felt threatened. Personally, I did see some looting, but that was a liquor store the day after the storm, and even the tourists were helping themselves. I have heard of other looting stories, but they are really minimal. Today, The communities in Georgetown look like they have been converted into shanty towns. Across Cayman there are: all the cars parked at strange angles (water moved them and now will not start), clothes lines crossing everywhere, people carrying dirty water in any container they can find so they can flush the toilet, furniture laying in the parking lot to dry, men sucking on a hoses to siphon gas (esso and texaco are not open)..... it really looks 3rd world........ BUT! BUT! I am seeing things in Cayman that I have not seen much of before: Neighbors that lived together for years and have never spoke are now hanging out in the street talking, sharing stories, sharing cigarettes, sharing a beer and helping each other out. The homeless are being adopted by neighbors. There is real community spirit! Essentially, the spirit of human kindness is shining though and all the people here should be proud by their actions in the face of this adversity. One final note: Non essential Expats are being asked to leave the island, so to reduce the resources needed to rebuild the Country. of peoples lives and livelyhoods. Our prayers are with all in Cayman and hope our friedns get off safely. has been tremendous and for that we are so grateful." - Thanks for the Hurricane Relief! Thank you so much for the VERY needed supplies! Today we received a commitment from PEPSICO for donation of multiple containers containing Rice-A-Roni, Quaker Granola Bars, Cereal, Cookies, Gatorade and bottled water. Shipment will commence next week. Special Thanks to Roger Enrico, retired PepsiCo CEO! On September 14 Operation Blessing received a USD$100,000 cash donation designated for Cayman Islands Hurricane Relief from a private individual who requested anonymity; special thanks to Susan Paul and Leigh Rich for tireless support of Operation Blessing relief efforts! We are asking many other US Corporations for products that will help ease the suffering of the people of the Cayman Islands. Operation Blessing operates a trucking fleet, and will provide free transport to the port. If you can help, please contact Bill Horan in the US or Captain Eugene Ebanks in Grand Cayman. from Diana. An easy way to help out! Subject: Re: Am trying every avenue to get media coverage! diapers. Can we wait until then??? I will also try to get more stuff. > fact I am right up the road from you in Marble Falls. > the Houston airport let me know asa. > I have set this up for storm info purposes. My brother, David Macdonald, is in the Cayman Trade Centre building (Designcraft) on Eastern Avenue. He has been sheltering around 80 + people there since Friday and is trying to figure out how to get them alternate help, as he is out of food and supplies and cannot tell them what to do next. He's been unable to get any information on other relief areas or where they might find assistance. He has a wife and baby and is worried about his safety if things get out of hand. Any suggestions? On another subject, he has available large inventory of awning materials (amongst others) which he says is good for covering up open areas instead of plywood if necessary, and will try to help people out with that if he can. Text message to C&W Mobile Phones on the island. So if you can't get through by normal calling, try this option as well. someone know that you are very worried about him/her.